Stone School has a fascinating history, which dates back to the middle 1800s. In 1853, when Michigan was still very young, a farsighted citizen, Dr. Benajah Ticknor of Cobblestone Farm leased the triangle of land on which the school sits to the budding school district, for the purpose of building a school. The following year, the first Stone School opened its doors for students of the community. However, by 1911, a half century later, the school was no longer adequate for the growing population. 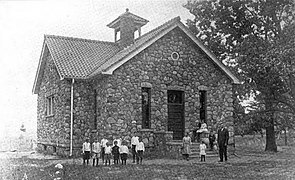 Members of the community rallied, tore down the small stone school and built the present larger Stone School House. Stones from the first school were saved and used in the newer building, along with additional stones from the neighboring farms of the Hutzels and Ticknors. By mid-century, even the larger Stone School could no longer accommodate the student population. A $90,000 bond issue was passed to build a larger school and in 1949, the new, “ultra-modern” Stone School opened its doors across the road from the old one. The “old” Stone School, in turn, closed its doors, but only until parents got together to renovate the little schoolhouse to provide a place for noon activities and community gatherings. Paneling, ceiling tile and a full kitchen were installed in the basement, while the two outhouses were replaced by a small, cement block structure added to the rear of the building. The schoolhouse served in its new capacity for only a few years. By 1953, it stood silent and empty. Then a group of parents headed by Millie Seltzer sought and received permission from the school board to use Stone School for a much-needed nursery school. 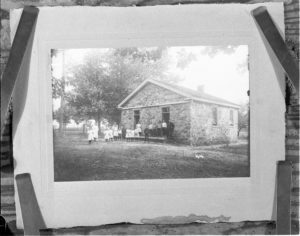 The parents spent many months holding fundraisers and renovating the schoolhouse for the pre-school. Finally, in September 1955, Stone School Cooperative Nursery opened with classes for three and four year olds. The adventures of Stone School did not end, however, for on two occasions it came close to closing its doors again. Once, in 1958, the Fire Marshall declared the building unsafe. Parents again came to the rescue. Eleven co-op fathers spent over 100 hours enclosing the furnace with a cement block wall and a fireproof door. The school reopened. Another time, in 1979, a fire damaged wiring and paneling in the basement. This time, a company of Seabees responded to the call for help. They stripped the old paneling from the basement walls and with materials provided by Stone School Nursery, installed new wiring and new fire resistant paneling. The nursery school was in business again. Stone School Cooperative Nursery grew over the years from the original two classes to four and added a popular summer program of eight-week camp sessions. 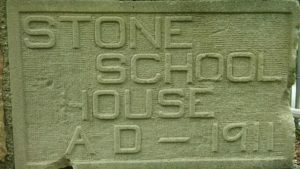 But in 1994, the Ann Arbor Board of Education let it be known that Stone School would soon be put up for sale. Unless Stone School Nursery could find a way to purchase the little school, its forty-year relationship with the stone schoolhouse would end. A one-year lease extension was negotiated. On October 11, 1995, after months of fund-raising and negotiation, the Stone School Cooperative Nursery purchased Stone School, making the historic building its permanent home. That same month, Stone School gained national recognition when it was listed on the National Register of Historic Places. With ownership of the historic schoolhouse came the responsibility of care and restoration. Stone School Preschool takes that responsibility very seriously. In 1996, through impressive fundraising and with the assistance of a federal grant of $15,930, restoration of the Spanish tile roof and the chimney was accomplished. In addition, a skilled stonemason repaired stonework at the front entrance, the basement playroom was transformed with its first redecorating since 1979, and the exterior trim was given a long-overdue painting. 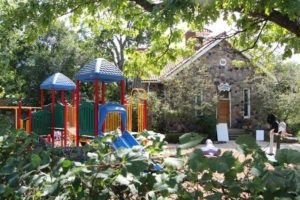 In 1997, a new high-efficiency furnace was installed to by-pass the chimney that had a crumbling flue and additional paving was installed on the playground to expand bike-riding opportunities for the students. The next formidable task was the restoration of the wooden sash windows, which were badly in need of repair and preservation. The process required removal of the windows for restorative work at a wood shop, then reinstallation. One half of the windows were finished by the spring of 1998, the second half by the spring of 1999. The warped front door was also replaced with a solid mahogany paneled door specially built to resemble the original. New carpeting was installed in the front hall/office area. In 2005, the mortgage was fully paid off, making Stone School one of the few cooperative nurseries in North America to own its building. In 2007, the school spent over $37,000 to improve drainage and waterproof the foundation. This was paid mostly from savings, but partly with a bank loan. The loan was fully repaid in 2009, and the school is now saving for a future basement renovation! A long history of sound fiscal policies, plus committed parents and teachers, make it possible for a small non-profit organization to tackle these challenges. The little Stone School holds an important place in the history of southeastern Michigan. It is an historic gem—an Ann Arbor landmark—which with proper care should last well into the next century. Stone School Cooperative Preschool is proud to be instrumental in its preservation.